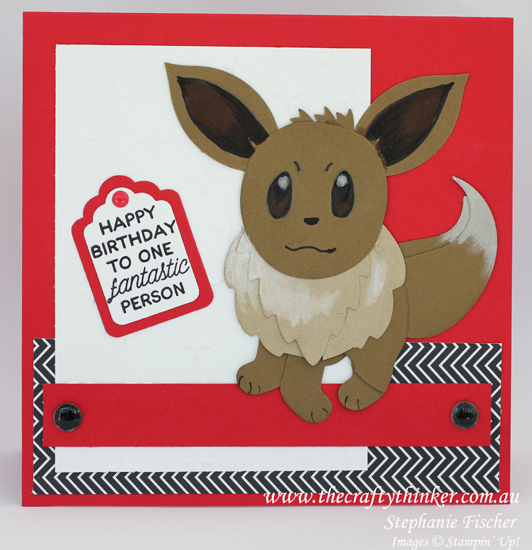 I was at a loss about what to create for my great nephew's birthday card and then remembered that he likes Pokemon. In fact, he recently went to school dressed as a Pokeball! I've already made a Pokemon card for him in the past so had to hunt for a different Pokemon to make! Meet Eevee. Eevee looks a pit non-plussed that the embossing isn't showing in the photo! Unfortunately, the embossing on the Whisper White piece is not showing up in the photo (and I had already given away the card before I realised). The main card is a 5.5" square in Real Red. The little strip of DSP is from the Pop of Pink set. There's a Real Red Enamel dot on the greeting label and you may be wondering where the black ones come from? Having seen someone else peel the white backing from the White Perfect Accents to create clear dots, I thought "why not try to then reapply them to some black cardstock. I must admit that I really miss the neutral colours that were available in the Candy Dots range. I haven't included full instructions for Eevee here only because there was some free-handing involved but feel free to contact me for more details. Head: is the centre of one of the Swirly Scribbles thinlits. Hind leg: Santa's Sleigh thinlit & Paisley framelit with a little bit of nip & tuck! There's also part of another Paisley framelit just showing under the mane for a suggestion of tummy or 4th leg. I used a Chalk Marker to colour the tail and the mane and add the white dots to the eyes. The ears and eyes are coloured with Basic Black and Chocolate Chip markers. I used Soft Suede and Crumb Cake cardstock.